Miracles of miracles! The 7 train is cooperating at last! Spring is here (it’s April after all). I was in the mood to travel from Long Island City for a bit, but to go somewhere I liked on Greenpoint Ave., and to have some great chicken. So, I was off to Riko’s. Hurray! As I chomped on some toasted choclo (Peruvian fat corn, it’s like corn nuts) while perusing the menu, my waitress asked if I wanted chicken or beef. I said “chicken”, since I love their rotisserie chicken. She then steered me to try the Pollada special, which includes the 1/4 lb of chicken (yum!! 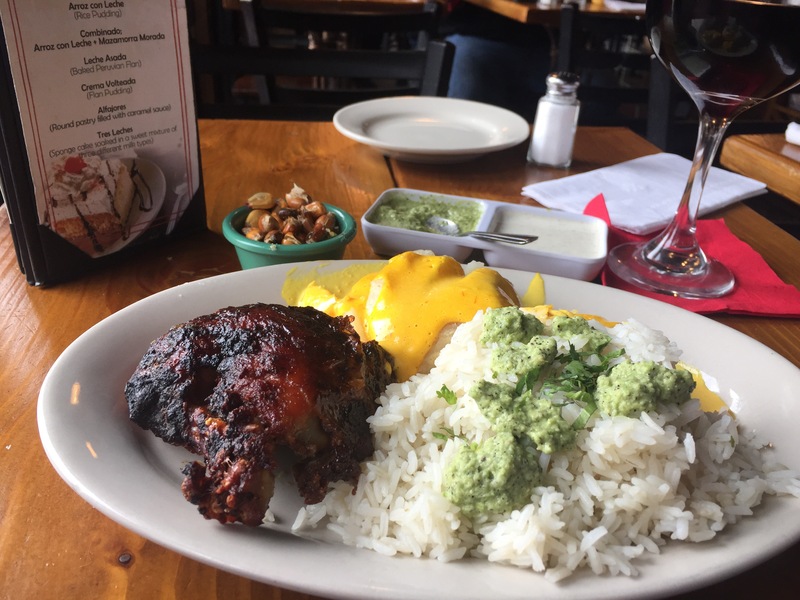 with dark meat), rice with verde sauce on the side, and boiled potatoes with salsa a la Huanciana = a Peruvian spicy cheese sauce. I wish I had more Lactaid; I would had finished the potatoes easily. The sauce was a creamy concoction that was street-sign yellow with red flecks streaking in it (possibly from aji Amarillo chilies). It was deceptively spicy, meaning it started out as mild, but five minutes later the back of my throat was very warm! Also, the glass of red wine is helping out a lot. I heard so many complaining about their lot in life, I had enough of listening to their negativity. Plus, it cuts down the spicy heat ;).